Thanks to my Climate Camp partner Kristina Hulvershorn, Youth Program Director for the Peace Learning Center, I was recently introduced to Louis B. Russell School #48. This introduction was in the context of a Climate Camp day camp we were doing at Freewheelin' Community Bikes, pretty much right across the street from #48. That was about a month ago, and while none of those students attended our camp, we had a wonderful day on bikes and you can read about it here. 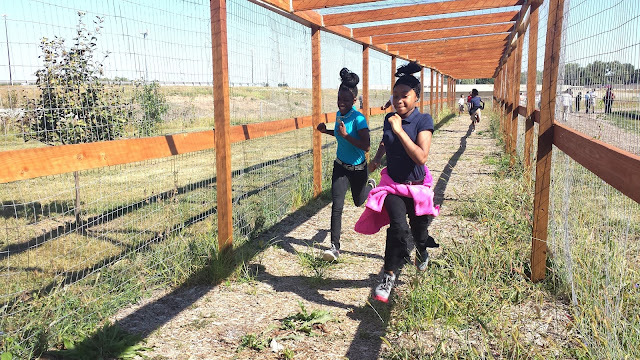 This intro to #48 led to planning an IndyGo adventure to Indy Urban Acres. Those of you familiar with this blog know that Indy Urban Acres is a frequent partner for our work at Earth Charter Indiana and Youth Power Indiana. Tyler Gough at Indy Urban Acres is in charge of growing food that goes directly to food banks in Indianapolis. Indy Urban Acres is part of the Indy Parks system, and is in partnership with Gleaners Food Bank. Tyler himself is engaged in constantly improving his farming methods, adding a no-till strategy to his already organic-minded one. You can read a story about Tyler and his work with Kevin Allison, from the Marion County Soil and Water Conservation District here. Tyler is an educator as well as a farmer, so I love taking kids out there for the fresh air, the fun, and the food instruction. Depending on the time of year, Tyler sends soil and seeds home with kids to start their own food garden. As of last year, I began to take students to Tyler's Indy Parks farm on IndyGo. It doubles the sustainability instruction: responsible farming is an act of sustainability, carbon dioxide footprint reduction, and carbon sequestration and thus climate recovery. To take mass transit is to reduce our carbon footprint and increase our sustainability. It's a win-win from Mother Earth, who desperately needs a lot of check marks in the "win" category. Ms. Stone from #48 — along with numerous staff members of the school, including the principal, Mrs. Sam — invited me to come in and talk to the 6th graders before our bus adventure. 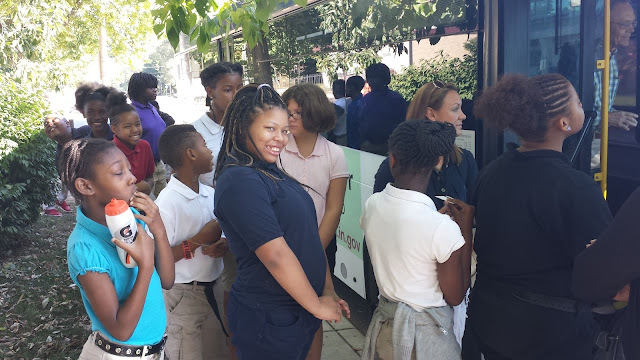 I did so on Tuesday this week, first presenting my standard Climate Change 101 slideshow, then connecting climate change to our decision to take a city bus for our field trip, and lowering the carbon footprint. Whether I am advocating for bikes or for cars, the message also includes the numerous studies I've read that say one can save up to $10,000 a year by not even having a car. That amount is based on car payments factored out of time, plus gas, parking costs, insurance, maintenance, and other factors. That usually gets a wide-eyed response! On Thursday, I returned to the school with a couple dozen day passes in hand, courtesy of my friends at IndyGo. IndyGo has now provided me passes for about a half dozen adventures, and as the word spreads, I have no doubt other schools will want to get into the game. 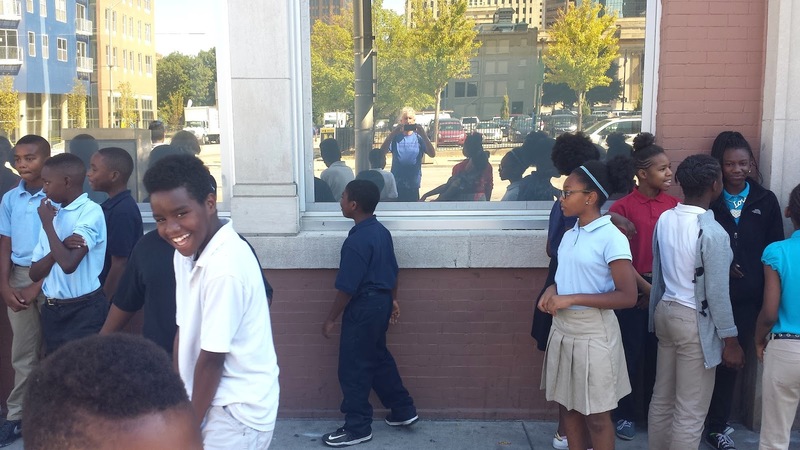 The three dozen 6th graders, along with their teachers and a volunteer, emerged from the school to await the #19. On my Tuesday visit, we determined our path using IndyGo's web site, which I shared with IndyGo so that the drivers would not be surprised at the sight of a mob of kids waiting at a stop. As we got ready to head to the bus stop just across the street from the school, located at the intersection of Central Avenue and 34th Street, one kid pointed up Central and asked: "Is that our bus?" The bus proclaimed "GARAGE" on its display sign, so I responded that no, it was headed the garage and just happened to be stopped right there. IndyGo had actually sent a bus especially to us for our field trip. The teachers were happy about that, and while I was struck dumb by the generosity and sweetness of that, I was also a little disappointed, as it wasn't quite the authentic experience I was hoping to have. The teachers were happy however, because most of the students had never been on IndyGo before, and so they like the more controlled setting of having a dedicated bus. After a moment's thought, I decided I agreed. Especially as it took a long time for the students to line up and run their cards through the IndyGo machine! Boarding the bus near School #48. Once the students were on board, I learned an additional bit of information that this route, the #19, would become our next bus, the #30, and so we wouldn't even need to transfer. While this made it easier, I have to say I was once again slightly deflated. 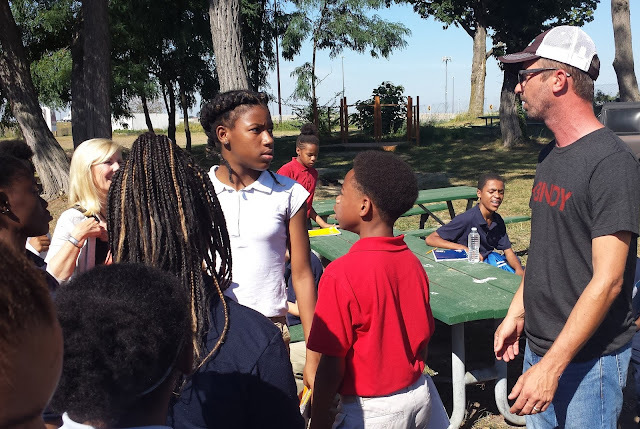 Two summers ago, I visited a summer camp in Fountain Square via the Southeast Community Services Center. It was those kids, aged 8-17, who taught me how to use IndyGo in a robust way, transferring from one line to the other. Honestly, I had only gone on direct trips (to and from the downtown, never downtown, then east or west). So thanks to the great educators at that program for helping me understand just how effective our mass transit system can be. The now number 30 took us to the intersection of 21st and Shadeland for the nearly mile walk to Indy Urban Acres. The supervisor, whose name I never learned, pulled me aside at that stop. I told her back at School 48 how grateful I was for the special treatment but that I thought we could handle it on our own. She asked me on Shadeland, with hundreds of cars hurling past us, if we wanted to be on our own in catching the #30 and then transferring to the #19 for the voyage back. I told her yes, and responded that we were on our own. 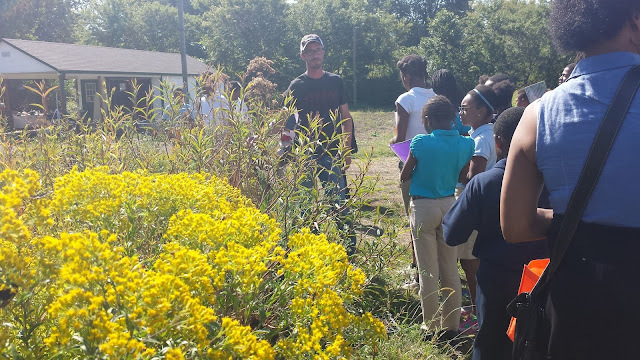 We walked to Indy Urban Acres and Tyler Gough did his tour and instruction. Here are some images from the experience, before we return to our mass transit story. Tyler always encourages kids to race through this structure to blow off some steam before the tour. Tyler Gough, center, showing the kids around. The #48 science teachers, Ms. Stone and Mrs. Peterson, turned this visit into an assignment. 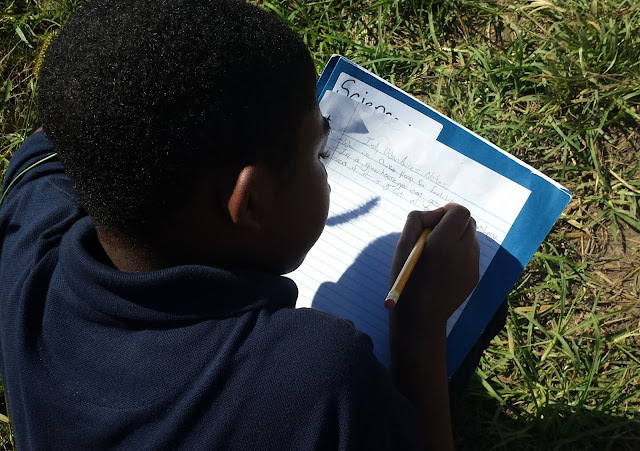 Here, one student is taking notes that will form the basis for the essay he'll be producing for the class. 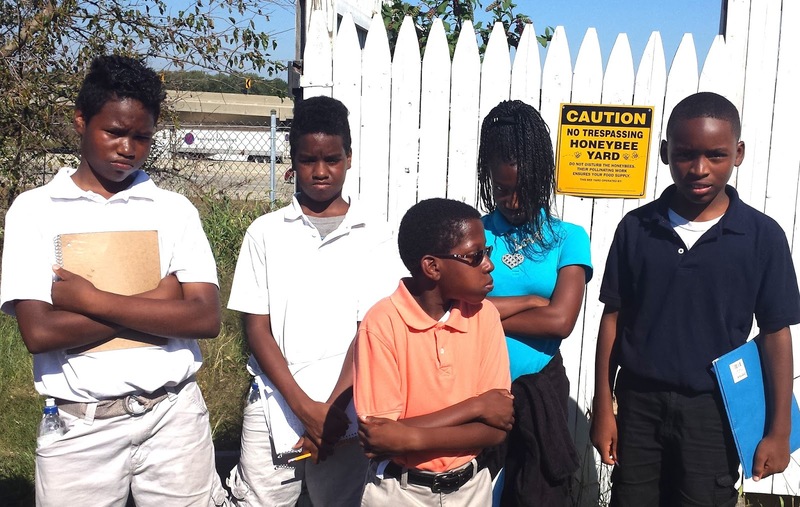 When the students learned about the vital importance of bees to pollinate our food, they agreed to pose as bodyguards in front of Tyler's apiary, a hive that houses approximately 60,000 bees. 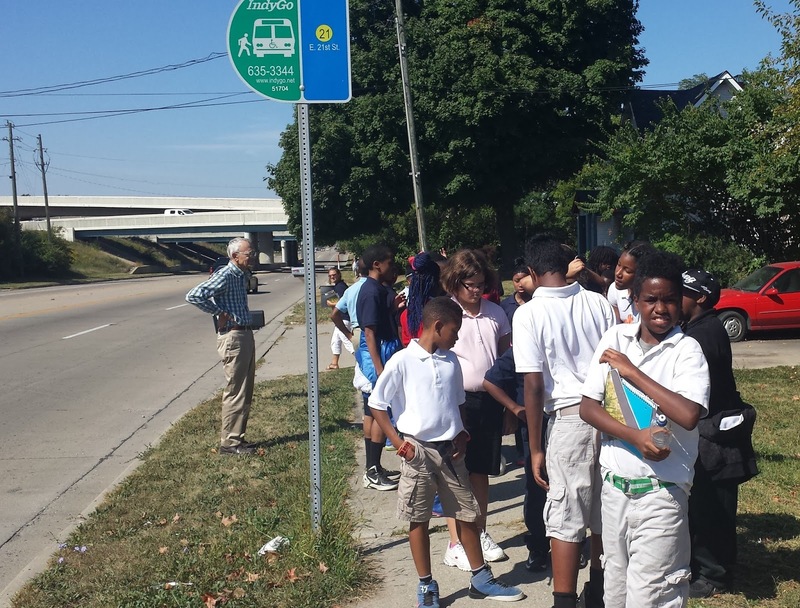 As we finished our tour, and started hiking back to catch the #30 at Shadeland and 21st, I realized that there was a bus stop for the #21 right next to Indy Urban Acres. A quick search on my cell phone resulted in an IndyGo map that said #21 would be a perfect way to return to the school. In fact we'd end up transferring downtown which I thought would be fun for the kids. So after a quick consult with the teachers, we changed our plan and awaited the #21. 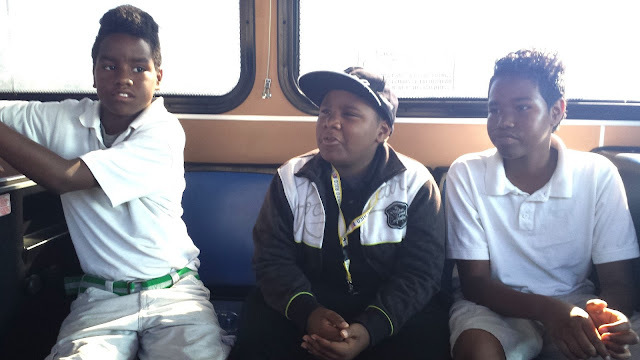 These three gentlemen showed great leadership skills throughout the day, helping with our tour as well as giving up their seats for others on our way back to their school. We had a brief pause downtown as we awaited the #19 to get back to the school. There, I gathered a bunch of students around me to announce my son Julian was turning 25 that day, and asked if they would they sing to him. They had heard about Julian on Tuesday, as I told them that one of my sons had decided not to drive, in good part because of that cost savings. So they were more than happy to sing to him, but first, we had to sing to someone else. One of the School 48 students on our field trip is named Heaven, and so we sang "Happy Birthday" to her, before singing to Julian on his voicemail. I had never sung "Happy Birthday" to Heaven before. It seemed like fitting celebration for our lovely day of travel and fun, a moment to pause and be grateful for everything, from the beautiful sunlight, to the generosity of Tyler Gough and of IndyGo, and the friends we made on the bus, like Midnight Rose, whom I spoke with the entire trip from Indy Urban Acres to downtown. We are already planning our next adventure. Waiting on the #19, downtown. Woah, you guys look so adventurous, seems like you all had a great time there. Great job! And share more of the pictures of this wonderful event that you had. When you use the supplement, it can help to boost your metabolism up date and it energizes your body.